The Partysquad, probably best known in recent months for their high-profile work on Major Lazer single Original Don, are interesting musicians in their own right; they’re a group that keeps up with the times and isn’t afraid to venture into any number of genres. 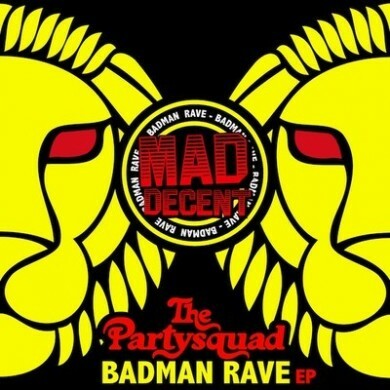 The Badman Rave EP certainly isn’t their first dip into dancehall, but they do manage to freshen up the sound for larger crowds by inducing it with infectious hardstyle and house to make tracks that are nearly impossible not to dance to. The title track, Badman, flicks between reggae grooves and a pulsing dancefloor beat that definitely gives the listener breaks between its hardstyle breakdowns. Where the track could be overloaded, it instead comes off as minimalistic in its drops, creating a nice contrast against its more melodic parts. It’s a bit unusual in its changing tempos for your typical dance track, but it definitely does the trick on the floor. Go Down Low is one of the more Major Lazer-esque tracks on the album, written in a similar vein as Pon de Floor or Jump Up. However, it’s an infectious and well-written track in its own right. It perhaps does a better job as a straight banger than Badman does, in that its verses are just as danceable as its chorus. Gunshot is the day to this song’s night, so to speak; it’s happier in its melody and consistent in its rhythms, a perfect tropical daytime dance track. Lighterman has one of the strongest buildups on the whole EP, complimented with snare drums, truanced vocal clips and a pulsing baseline that’s the happiest punch to the stomach you’ll ever have. It will be interesting to see how DJs make use of the track’s wonderful contrast of high and low energies. Pullup 2012 is the most house-influenced track on the EP, and therefore one of the ones you’re most likely to hear in played this summer. It’s not the most complex or catchy track in the world, but the sprinkles of Soca and Reggaeton throughout give it just enough of a flavour to spice up your typical electrohouse set. Soundbwoi isn’t a strong or different end to the EP, but it’s a decent track in its own right. It would have done better placed near tracks such as Gunshot, but it’s understandable that the Partysquad wanted to spread out their more ‘daytime dance’ tracks. It’s got a good groove going to it, regardless of placement, and is pleasing to the ears if not much else. The entire EP is driving and incessant, pulling the listener through a whirlwind of dance genres and beats. The minimal drops the Partysquad employs are a welcome break from this world we live in where drops are so often trash heaps to pile stray sounds on top of. The Badman EP is a great way to revitalize your sets with something that’s sure to make a crowd jump, bump, grind, and whatever else their feet desire. Badman Rave EP is available on iTunes, Mad Decent’s Drip FM page (for subscribers only), and can be streamed on their soundcloud.